The architect of the original Pennsylvania Station between Seventh and Eighth Avenues and 31st and 33rd Streets was McKim, Mead & White. 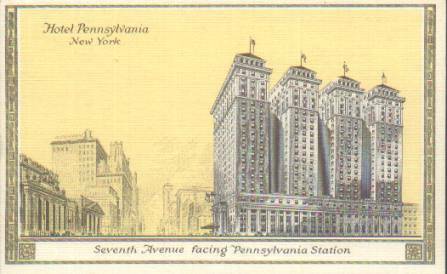 The architect of the Hotel Pennsylvania across Seventh Avenue from the entrance to the original Pennsylvania Station was McKim, Mead & White. The demolition of the original Pennsylvania Station was one of the greatest losses the city has suffered, a loss not justified by the very bland and unattractive office building and underground transportation complex and the new, circular Madison Square Garden arena that replaced it. There are plans now afoot to demolish the Hotel Pennsylvania and the less than brilliant but quite serviceable Madison Square Garden as part of a very ambitious and complicated scheme to create a new train terminal within the James A. Farley Post Office Building, also designed by McKim, Mead & White, across Eighth Avenue from the existing Madison Square Garden. In early October, 2007, Vornado Real Estate Trust began erecting scaffolding around the hotel, which, according to an August 14, 2007 article by Julie Satow in The New York Sun was netting "Vornado $30 million in gross profit annually." These new plans are a central part of a much larger plan by the city to significantly redevelop much of southwest midtown Manhattan, a plan that involves an expansion of the Javits Convention Center, the creation of a major new angled boulevard between 42nd and 34th Streets to be known as Hudson Yards, and the creation of a major new residential and office complex on platforms over the east and west train yards between 30th and 33rd Streets east of 10th Avenue, and an extension to the west of the 7 subway line. This is a heady brew that if executed would result in a dramatic new mixed-use district that would be about the size of the Financial District in Lower Manhattan. While it would take several years to simmer, it could prove to be competitive with the renaissance of Lower Manhattan and the redevelopment of Ground Zero given the historic proclivity of some business executives to want to avoid a commute downtown. 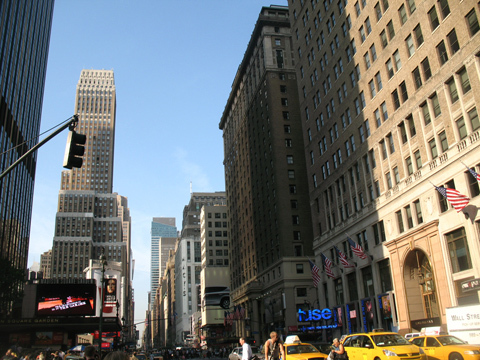 An environmental study released in October, 2007 by The Empire State Development Corporation has proposed a two-option plan, one of which is dependent on the relocation of the present Madison Square Garden to the west end of the Farley building. The owners of the Garden, however, have not yet agreed to the plan. Another component of the state plan might permit the transfer of undeveloped air rights over the Farley building to sites on the existing superblock with the Garden, the One Penn Plaza office building that replaced the original train station and to sites on either side of the even taller Two Penn Plaza office building in the middle of the block bounded by Seventh and Eighth Avenues and 33rd and 34th Streets. At one point, Vornado was planning to build two very tall office buildings on the site of the existing Garden, but in recent months public officials were reported to have decided against such a plan as too crowded. The design of the planned towers was never released to the public but were understood to have been exquisite skyscrapers. The state's plans include options to transfer the unused air rights to sites within a new Penn Station "District" whose boundaries would extend across Seventh Avenue and the plans would include an incentive bonus of about 2.7 million square feet of developable space though the environmental document provided no information on how such a huge figure was arrived at, or the justification for the greatly increased zoning envelopes envisioned in the "District." The "District" and much of the enacted "Hudson Yards Zoning" have the highest zoning permitted in the city for many of the contained parcels, a 30 floor-to-area-ratio (FAR), whereas the highest FARs elsewhere in the city now are generally 10 to 15. The Metropolitan Transportation Authority recently announced the five joint ventures that submitted bids for the development of its exposed rail yards near the Hudson River and some of the ventures reportedly included commitments to relocate there by Condé Nast and Morgan Stanley, major tenants in relatively new buildings in Times Square, and Fox, which is a major tenant in a building on the Avenue of the Americas near Times Square. As an indication of the rather incredible "momentum" that has suddenly been generated for reshaping an area notorious for its uninspired architect and very substantial traffic problems in the nearby Garment Center and the Lincoln Tunnel was the recent disclosure that Merrill Lynch was considered relocating from the World Financial Center at Battery Park City into a very large skyscraper on the existing site of the Hotel Pennsylvania, which is one of very many sites in the vicinity owned by Vornado Real Estate Trust. The Merrill Lynch plan is astounding given recent disclosures about the fact that it has lost several billion dollars this year in investments related to sub-prime mortgages and that a move uptown might cost it about one billion dollars more than remaining in Lower Manhattan. The relocation plan is all the more stunning given that it would be damaging to the image of Lower Manhattan was a financial capital. On October 27, 2007, the front page lead article in The New York Times by Landon Thomas Jr. and Jenny Anderson indicated that Merrill Lynch was weighing the ouster of its top officer, E. Stanley O'Neal in the "wake of a third-quarter loss of $2.3 billion and an $8.4 billion charge for failed credit and mortgage-related investments." The article also indicated that Mr. O'Neal, who received $48 million last year from Merrill Lynch, "also clashed with his directors over an approach he made to a rival bank, Wachovia, for a possible merger." An accompanying article by Eric Dash indicated that Mr. O'Neal is entitled to $30 million in retirement benefits as well as $129 million in stock and option holdings "that would be top of the roughly $160 million he took home in his nearly five years on the job," adding that "Mr. O'Neal would walk away with an even bigger pay package if he left after a merger - a potential $274 million payout." Both the Times articles on Mr. O'Neal October 27, 2007 did not discuss Mr. O'Neal's apparent intention to abandon Lower Manhattan and erect a skyscraper with enormous trading floors on the site of the Hotel Pennsylvania. Clearly, this is very, very, very high stakes gambling. One suspects that Mr. O'Neal may become almost as infamous as Kenneth Lay of Enron fame and perhaps the controversy over his leadership might waylay a relocation of Merrill Lynch to the Hotel Pennsylvania site. Incredibly, in the midst of all this fast and furious juggling of Manhattan's future by a handful of major players the preservation community has been relatively quiet about the Hotel Pennsylvania. It is one of the last surviving examples of very large hotels built to accommodate train travelers. In the Grand Central Terminal neighborhood, the former Commodore and Biltmore Hotels have been transformed from their original elegant designs as part as Warren & Wetmore's grand "Terminal City" complex and rumors abound that the Roosevelt Hotel, the last of that district's major "railroad hotels" may be demolished. The Roosevelt is more elegant than the Hotel Pennsylvania but the Hotel Pennsylvania was designed by McKim, Mead & White specifically to complement the spectacular and very imposing entrance of the original Pennsylvania Station. 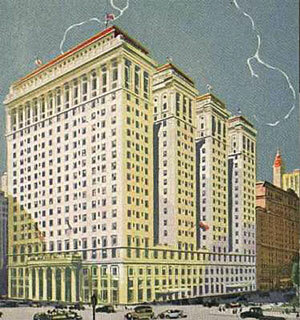 Furthermore, unlike the Grand Central Terminal precinct that has been largely transformed from a masonry district to a polished granite and glass area, the Hotel Pennsylvania is the northernmost of three similar substantial masonry buildings on the east side of Seventh Avenue south of 33rd Street and one block south of the great Macy's masonry edifice and the masonry edifice of the tall Nelson Tower on the northwest corner of Seventh Avenue and 34th Street. Just across 32nd Street from the Hotel Pennsylvania is the handsome Affininia Hotel that was formerly Southgate Towers and originally the Hotel Governor Clinton and which was built in 1929 with 1,200 rooms. 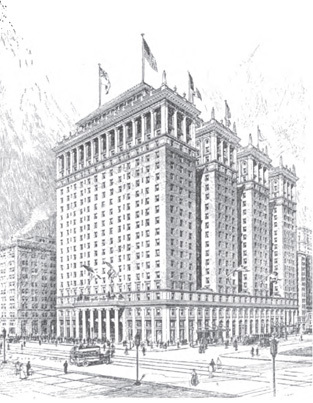 While many commentators have remarked on the fact that numerous ownership changes at the Hotel Pennsylvania over the years have made major changes to the interiors, which are not of the luxury class, its facade is stately and handsome. Furthermore, it is not a small building and at one time boasted that it was the city's largest. 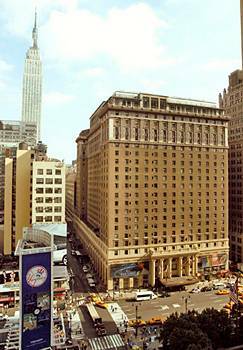 The hotel, whose address is 401 Seventh Avenue, was erected by the Pennsylvania Railroad in 1919 and was operated by Ellsworth Statler and was acquired by the Hotels Statler Company in 1949 and renamed the New York Statler Hotel. After all 17 Statler hotels were acquired by Conrad Hilton in 1954, it became The Statler Hilton. In the early 1980s, Hilton sold the property and it became the New York Statler again. In 1984, it was acquired by the Penta chain and became the New York Penta. In 1992, it reverted to the Hotel Pennsylvania. The hotel's telephone number, Pennsylvania 6-5000 is supposedly the New York City telephone number in longest continuous use and was famous as the name of a song by the Glenn Miller band. Other bands that played in its ballroom were the Dorsey Brothers, Count Basie, and Duke Ellington. In January, 2007, Lehman Brothers expressed interest in the Hotel Pennsylvania site, subsequently Merrill Lynch became the primary potential user of the site. According to an October 25, 2007 article in The New York Times by Charles V. Bagli, Merrill Lynch was negotiating a "billion-dollar 65-year lease" that called for demolishing the hotel and erecting a tower with 80,000-square-foot trading floors in its base. In his October 15, 2007 article in The New York Observer, Chris Shott reported that Gregory Jones, a member of HOPE (Hackers on Planet Earth), which has been holding a conference at the hotel for more than a decade, had mounted a campaign to preserve the hotel and nominated it for designation by the Landmarks Preservation Commission. A section of the organization's website, hope.net, is devoted to news and commentary about Vornado and its plans for the hotel site, Mr. Schott wrote. Some commentators have made light of the historic significance of the Hotel Pennsylvania, but compared to the thousands of relatively insignificant structures in many of the city's "historic" districts the fame of the hotel as the venue for many of the country's greatest bands is not inconsequential. The Hotel Pennsylvania is what McKim, Mead & White, the greatest architects in the city's history, felt was appropriate to confront travelers exiting from its great and very greatly lamented original Pennsylvania Station. There is something a little obscene about demolishing perfectly workable structures whose replacement costs would be extremely high. While demolition may satisfy some Americans' thirst for violence, it is often an extravagant and inexcusable urban exercise especially in light of the country's interesting record of "adaptive re-use" of historic structures. The Hotel Pennsylvania is not a blight on the city's urbanscape. Given existing zoning, the bulk of the Hotel Pennsylvania does not leave any "undeveloped" air rights. Some commentators have suggested that a Hearst Building scenario might work, but that is unlikely. Since the city is conjuring up bonus space in its Farley/Penn Station schemes, why not give an enormous amount of additional air rights for saving the Hotel Pennsylvania especially since public officials apparently want to create a wide district capable of receiving air rights and especially since some commentators actually think that the city's core personality is based to a great extent on very tall buildings and that New York has fallen significantly behind the rest of the world in big skyscrapers. It was somewhat surprising, and refreshing, therefore, that the landmarks committee of Community Board 4 voted Tuesday night 6 to 1 to recommend that the Landmarks Preservation Commission designate the hotel as in individual landmark. Joyce Matz, a long-term member of the Community Board and a preservationist who holds projects up to the letter of the law so to speak, told the committee that she had asked three architectural historians about the significance of the hotel and she said that all three historians maintained the project was not the best work of McKim, Mead & White and she pointed out that that it was not designed by one of the original partners. Such comments, however, are very misleading. Gordon Bunshaft and I. M. Pei did not design all the masterpieces by their respective firms, Skidmore, Owings & Merrill and Pei Freed Cobb, and as anyone who follows the starchitect gossip it is clear that not every project by a star architect is a masterpiece. Other comments read at the meeting by "preservationists" such as Peg Breen of the New York Landmarks Conservancy and Kent Barwick of the Municipal Art Society were not at all consistent with the established principles of historic preservation in New York City. Ms. Breen suggested that the hotel was seedy and not well loved, which has absolutely nothing to do with the building's exterior. Mr. Barwick, one of the most intelligent of all New Yorkers, apparently tried to avoid the question by suggesting that it was not as important a landmark as the Farley Building, which is true, but which also wrongly implies that the Farley Building is a masterpiece, which it is certainly not. The Community Board voted 21 to 8 to 8 with two present and not voting to recommend November 8, 2007 that the Hotel Pennsylvania be designated an official city landmark by the Landmarks Preservation Commission. During its "public session," the board heard testimony from many employees at the hotel including its doorman that the preservation of the hotel was important to save jobs, an emotional issue that directly related to the building's merits as a potential landmark. Richard Collins told the meeting that the last band to play at the hotel was the Buddy Rich band in 1980 with singers Mel Tormé and Helen O'Connell. A long discussion then ensued among board members about the resolution. Meile Rockefeller cautioned that by "rushing" to recommend designation the board might be "acting too fast" in light of the many developments under consideration in the vicinity. She asked another member, John Mills, what effect the designation of the hotel might have on schemes to transfer air rights from the Farley post office building and Mr. Mills indicated that it was not yet possible based on public documents to make such calculations. 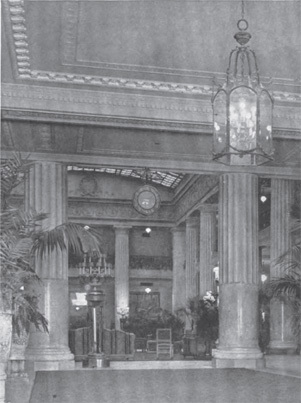 Some members questioned the historic value of the hotel and Howard Mendes, chairman of the board's landmarks committee, reminded them that a landmark's value is not based solely on architectural merit or historical considerations, pointing out that the hotel had considerable cultural history as a leading venue in its Café Rouge ballroom for many of the country's most famous band in the Swing Era such as Glenn Miller, at which point several female members of the board broke out into song singing "Pennsylvania 6-5000," one of his most famous songs whose title is the hotel's phone number that is still in use. Mr. Mendes also noted that some preservationists "are more concerned about the Farley building and are willing to look the other way." "This hotel has a lot of history of its own," he said, adding that "you might not like every detail, but it is certainly imposing." Layla Law-Gisiko reminded the board that the hotel was historically important for building over the tracks and being the city's largest hotel when it was built. Joyce Matz, a long-time board member and strong preservationist, read a statement explaining her intention to vote against the resolution. She said she was in favor of saving the building but that the community must look for other ways to save it than landmark designation such as public campaigns and appeals to the developers to study possible ways to "recycle" the building for other uses. She said that it was unlikely that the commission will hold a hearing quickly and added that an official landmark designation by the commission "won't happen." "It is an exercise in futility. It can take years and never happen," she said." She did not explain why she thought the commission would not designate the hotel adding that the hotel was "not up to the best work" of McKim, Mead & White. The Historic Districts Council, one of the city's leading preservationist organizations, sent a letter December 4, 2007, to Robert H. Tierney, the chairman of the Landmarks Preservation Commission, urging the landmark designation of the Hotel Pennsylvania on the east side of Seventh Avenue between 32nd and 33rd Streets. "Much discussion, planning and money have gone into the planning of the revival of the Pennsylvania Station area. It is ironic that the Hotel Pennsylvania, designed by the same architectural firm [McKim, Mead & White as the station, should not be part of these plans. Additionally, in this boom time of New York City hotels, what was thought to be the largest hotel in the world at the time of its opening should not be consigned to the dustbin of history," wrote Simon Bankoff, executive director of the council. Vornado Realty Trust indicated in a letter sent to its investors that appeared in a filing yesterday with the Securities and Exchange Commission that it is "hopeful that a scaled-back version and perhaps even a doubly scaled-back version" of the proposed redevelopment of the Farley Post Office building on Eighth Avenue between 31st and 33rd Streets "will happen." Ambitious plans to relocate Madison Square Garden into the western half of the full-block post office structure to open up its present site on the other side of Eighth Avenue to a major renovation of the existing Pennsylvania train station and permit the transfer of several million square feet of development rights in the vicinity were thwarted by the announcement last month that the Garden would stay put and renovate its existing structure. Vornado is a major property owner in the area and is a partner with The Related Companies in a joint venture in the proposed $14 billion redevelopment scheme involving the post office. The eastern end of the post office building, which was designed by McKim, Mead & White with a two-block-long colonnade along Eighth Avenue, has been planned as new train station for New Jersey transit. The smaller plan for the post office site, known as Moynihan Station, received many needed approvals and has the required funding already set aside, based on costs in 2006. In his letters to investors, Steve Roth, CEO of Vornado Realty Trust, said that "In my view, there has been too much public endorsement of the idea of this project for nothing to happen." Vornado and Related had been designated as co-developers for a smaller-scale version for the post office redevelopment by the Pataki administration, and Vornado owns about 7.5 million square feet of commercial space in the area including the Hotel Pennsylvania on the east side of Seventh Avenue between 32nd and 33rd Streets that it was considering tearing down for a new headquarters building for Merrill Lynch. Merrill Lynch subsequently withdrew from that plan and some preservationists campaigned unsuccessfully to convince the Landmark Preservation Commission to designate it as a landmark since it was also designed by McKim, Mead & White and had been at one time the city's largest hotel and also was the venue for many of the leading bands of the 1930s and 1940s. Mr. Roth said that the planning process for the post office building "has frustrated all parties," adding that "It has been three years so far, a long, complicated road. The project requires public sector expenditures which, in the end, may not all be there….But in the end, it is surely worth the effort." "I am hopeful that something good will happen here," he said. "Much has already happened," Mr. Roth continued, "to increase the value of our Penn Station assets. The Penn Plaza District and the West Side of New York have been discovered and are the beneficiaries of an enormous amount of recent and current activity. 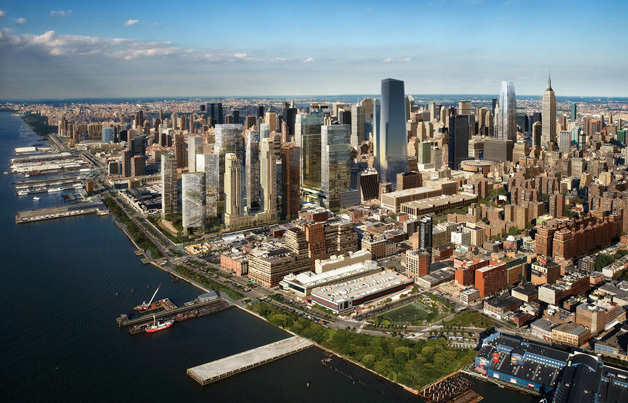 A huge swath has already been rezoned as the future growth corridor of Manhattan. Tishman Speyer has won the bidding to develop the Hudson Rail Yards into a 12 million square foot, 20-year, Canary Wharf-type project. Brookfield has announced 5 million square feet…. Vornado was the pioneer here, and owns the best and the lion's share of the real estate surrounding Pennsylvania Station - the gateway to the new West Side….The Hotel Pennsylvania, Seventh Avenue at 33rd Street, generated a best ever $37.9 million of EBITDA in 2007, $10.4 million more than in 2006, a 37.8% increase ….The credit crisis and Merrill's management changes disrupted this deal, but the fact remains that our site was the last man standing in a rigorous citywide search." The City Planning Commission voted unanimously July 14, 2010 to approve zoning changes to permit Vornado Realty to erect a major skyscraper on the site of the Hotel Pennsylvania on the east side of Seventh Avenue between 32nd and 33rd Streets. Planning Commission Chair Amanda Burden said the property, directly across from Penn Station and Madison Square Garden, is an "ideal location for high density development," according to an article by Jill Colvin at DNAinfo.com, adding that "at nearly 80,000 square feet, the site offers an opportunity for precisely the type of well-designed...office building that New York City needs to stay globally competitive." The commission's vote was attacked by several commenters at wirednewyork.com. Anti-nimby, for example, wrote, correctly, that Ms. Burden recently "chopped off the Tower Verre's shapley top/spire because...[she said it would not compliment the Empire State Building even though it is miles away uptown. Meanwhile, you're condoning this tower which will not only be much closer to the ESB and have a relatively flat, unspectacular top but will also totally obliterate the view of the ESB from the West." In April, Community Board 5 voted 36 to 1 against Vornado's plan to redevelop the 22-story Hotel Pennsylvania site with a 1,190-foot-high office tower designed by Pelli Clarke Pelli, who designed 1 Beacon Court on Lexington Avenue for Vornado. In late 2007, Merrill Lynch selected Vornado and its site for a new world headquarters but an article at observer.com by Eliot Brown noted that "just days later, preoccupied with $7.9 billion in write-downs, Merrill's board held off on voting on the headquarters plan." According to the article, Vornado told the commission that if it does not get the approvals needed for the project, it would proceed with an "as-of-right" commercial tower of about 1.15 million square feet. Vornado has been acquiring land in the vicinity of the old Pennsylvania Station for several years and had hoped to be able to use all of its unused air-rights to build at least one very major skyscraper on the existing site of Madison Square Garden, which it did not own. The owner of the garden, however, recently decided against selling and moving the area to the James A. Farley Post Office Building one block to the west. The original Pennsylvania Station was designed by McKim Mead & White and was widely recognized as one of the city's greatest Beaux-Arts buildings. Its demolition in 1964 led to the belated creation of the city's Landmarks Preservation Commission. 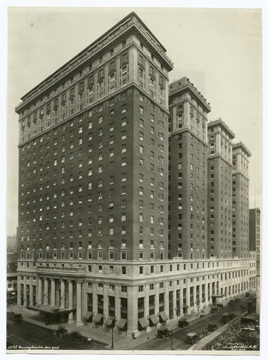 The 1,700-room Hotel Pennsylvania was erected in 1919 directly across Seventh Avenue from the famous train station and was also designed by McKim Mead & White. At one time, the hotel said it was the world's largest. The Hotel Pennsylvania is one of the last surviving examples of very large hotels in the city built to accommodate train travelers. It is across 33rd Street from a messy group of low-rise retail buildings. The hotel's telephone number, Pennsylvania 6-5000 was famous as the name of a song by the Glenn Miller band. The local community board previously had voted that to recommend that the hotel be designated an official city landmark but in February, 2008, however, a spokesman for the landmarks commission confirmed that the agency had decided not to hold a hearing on its possible designation. The Vornado plan, which must still be approved by the City Council, also includes the reopening of an underground passageway under the south side of 33rd Street, which will connect the Sixth and Seventh Avenue subway lines as well as the PATH Trains so commuters no longer have to transfer outside. "The entire roof on the west, or Seventh Avenue end, is occupied by a roof restaurant usable all the year around. It is really a big roof house and can be used as a summer dining room or during the other parts of the year as a banquet room. The roofs of the other wings are left open for future development. It is proposed that the roof of the second wing be used for an open-air roof-garden, and it has been connected by a bridge across the first court with the roof restaurant. Provision has been made in the framing of the building by which scheme of bridges can be extended across the entire series of courts." "Entering the main lobby, the effect of spaciousness is so happily impressed on the mind, that the thought of being at the bottom of a twenty-story building is entirely lost. This effect is enhanced by he use of a metal-and-glass ceiling over the central portion of the main lobby, lighted from above by indirect electric lighting. This gives a glow of moderate intensity, supplemented by various ceiling fixtures in the galleries and by standards on the floor. 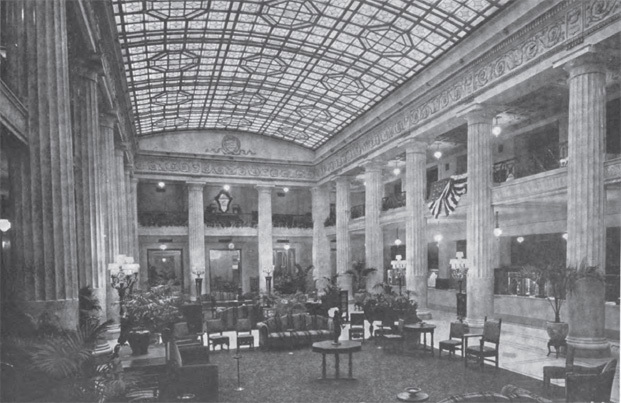 The main lobby is Roman in architectural character, in scale and detail harmonious with the motifs adopted for the Pennsylvania Station, but with a domestic note. Extensive use has been made of artificial marble made of Keen's cement, applied to the walls an columns and finished by polishing in the same way that marble is worked....The ballroom, the foyer and the parlors which lead into it are ...carried out in the spirit of the Italian Renaissance. In outline and decoration the ballroom shows a serious effort to preserve the traditions of the best examples of this period, and inspiration has been drawn from the fresco decorations by Giovanni da Udine in the Villa Madama and the Vatican in Rome....In working out the color scheme of decorations the architects called into consultation the emininant artist, Jules Guerin, who was of the greatest assistance in producing distinguished and harmonious results." "There is an absence of the familiar tendency toward the pompous, over-rich and rigidly formal in both the treatment of the walls and ceilings and in the furnishings. This is a distinct improvement, for it brings to hotel decoration a new dignity, which it could never have attained so long as ostentation was among its leading characteristics. This new tendency brings with it also an air of homelike comfort that contributes very largely to the satisfaction of the guest wearied by traveling, and does much to increase his esteem for the hotel." The owners of the 1,250-foot-high Empire State Building have criticized the plan of Steven Roth and his Vornado Realty Trust to demolish the nearby Hotel Pennsylvania and replace it with a 1,190-foot-high office tower. 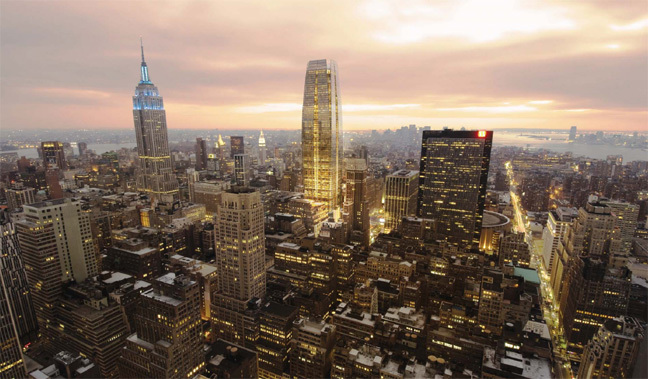 The proposed skyscraper has been designed by Pelli Clarke Pelli, the firm that designed the Beacon Tower on Lexington Avenue between 58th and 59th Streets for Mr. Roth. The Hotel Pennsylvania is 22 stories high and was considered the largest hotel in the world when it was built. It is across Seventh Avenue from the former site of Penn Station and both structures were designed by the famous architectural firm of McKim, Mead & White. Recent attempts to have the hotel designated an official city landmark failed. The proposed tower was recently entered into the city's official land-use review process and Community Board Five voted 36 to 1 with one abstention to deny the Vornado application, expressing "serious concerns" about "an application that offers few public benefits" in exchange for significant increases in size through special permits. Its vote is advisory. In a June 11, 2010 letter to Amanda Burden, the chair of the City Planning Commission, Vikki Barbero wrote that "The Commission recently considered the Jean Nouvel/MoMA building, and despite noting the proposed building's exemplary design and the lasting effects that this project would generate for landmarks and cultural institutions, it voted to reduce its size due to its impact on the city skyline and the surrounding neighborhood." 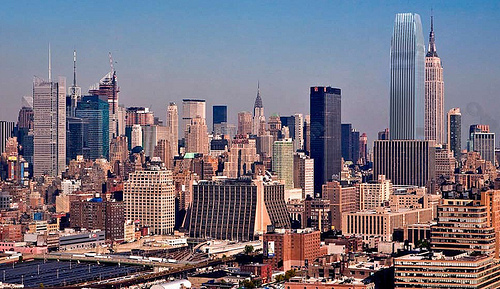 "In comparison," the letter continued, "the 15 Penn Plaza application wholly lacks the MoMA project's distinguished architectural features, produces no benefits for landmark preservation or cultural access, would have detrimental impacts on neighborhood density and traffic, and would notably diminish, not enhance the skyline position of its iconic neighbor, the Empire State Building from the west, thereby fundamentally altering and diminishing New York City's skyline in a way few projects have in decades. Should 15 Penn Plaza not be held to the same standards and criteria as Nouvel/MoMa." The commission "decapitated" the Nouveau project and insisted its design be lowered by about 150 feet to be more compatible with the Empire State Building. In a June 7, 2010 letter to Ms. Burden, Peter Malkin of Malkin Holdings, the owner of the Empire State Building, pointed out that the Empire State Building "is not discussed, or even mentioned in the Historical Resources section of the proposed project's Draft Environmental Impact Statement," which states that the standard established distance that should be considered is 400 feet and the distance between them is greater. "Applicant's exclusion of ESB from 15 Penn Plaza Project's impacts on historical resources may have been appropriate in ordinary circumstances; however, there are not ordinary circumstances. The scale of the 15 Penn Plaza Project is immense, more immense than ESB," Mr. Malkin argued, noting that the CEQR Manual "concedes that a larger study is appropriate for 'projects that result in changes that are highly visible and can be perceived from farther than 400 feet and could affect the context of historic resources some distance away....'"
Mr. Malkin also raised questions about the proposed tower's shadows, height, traffic and possible spire that might interfere with existing transmissions. In an article today at observer.com, Elliot Brown wrote that "Borough President Scott Stringer gave a conditional non-binding recommendation in favor of Vornado's plan, and the City Planning Commission approved it with minor modifications. It still needs to be approved by the City Council and it's not clear that Vornado has a tenant and/or financing yet to proceed if it is approved. An article by Matt Chaban published today at archpaper.com showed several renderings of how a planned 1,216-foot-high skyscraper on the site of the Hotel Pennsylvania at 33rd Street and Seventh Avenue would visually impact the Empire State Building and the midtown skyline. "Would a tower be allowed next to The Eiffel Tower or Big Ben’s clock tower? Just as the world will never tolerate a drilling rig next to The Statue of Liberty, why should governmental bonuses and waivers be granted to allow a structure as tall and bulky at 15 Penn Plaza to be built 900 feet away from New York City’s iconic Landmark and beacon? "We believe that the public approval process to date for the proposed 15 Penn Plaza has failed to address the interests of New Yorkers. The City Charter did not create the ULURP process so as to provide a speedy approval for a speculative office tower for which there is no planned commencement. The Developer’s Environmental Impact Statement at first ignored, and then (by last minute amendment) gratuitously denied, any impact on the largest Landmark in New York City from the proposed 1,200 foot tower to rise at some unspecified future date on the present site of the Hotel Pennsylvania. 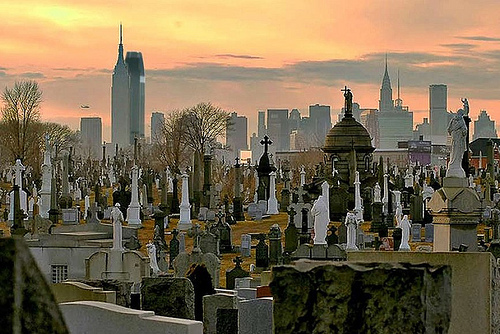 "The people of New York City have already made their sentiments clear: Community Board 5 voted down this proposal 36 to 1, so the only hope for protection of this public legacy now sits with the City Council. "There may be buildings taller than the Empire State Building. But no building so close to the Empire State Building should be allowed through discretionary official exceptions to be as bulky and tall as 15 Penn Plaza. The height and bulk of 15 Penn Plaza are the result of waivers and bonuses greatly in excess of code. Another waiver granted 15 Penn Plaza the right to build without setbacks. At only 67 stories, 15 Penn Plaza would be as tall as the 102nd floor of the Empire State Building, and would, if built, be as much a scar on the complexion of New York City as the loss of Penn Station. In an article yesterday at observer.com, Elliot Brown wrote that "Mr. Malkin has caught at least a bit of traction: On Tuesday, the New York Landmarks Conservancy decided to speak out about the tower on account of the effect on the Empire State Building; and other civic groups are considering similar actions." Zoning should be based on land-use principles and not monetary value and, anyway, $100 million is essentially peanuts when discussing a 1,200-foot-high office tower in midtown. The City Planning Commission was completely wrong to "decapitate" Nouvel's slanted skyscraper on the basis of its relationship with the top of the Empire State Building but why hasn't the mayor severely criticized if not fired Amanda Burden for such a preposterous ruling.